So last ime I left off with talking about choosing a vintage French handlebar that would give me more room for a large front bag. Finally I’ll explain how I chose the rack and bag. 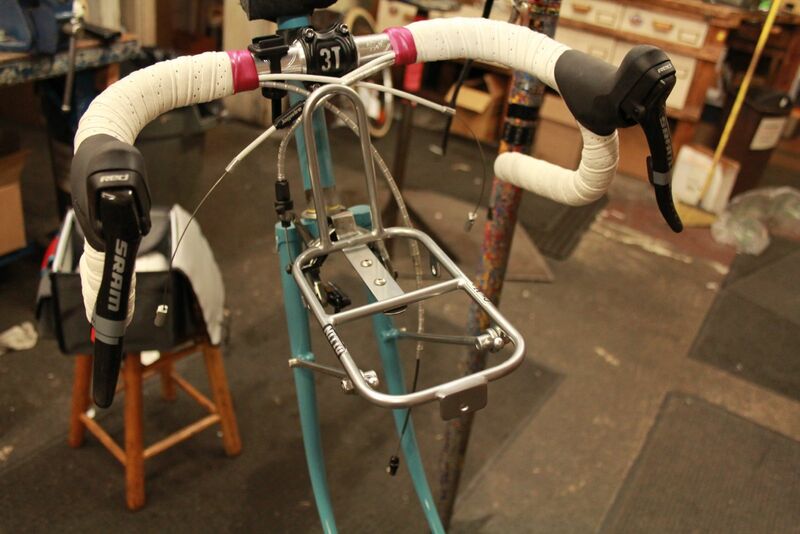 There are a number of front, randonneur-style racks on the market. 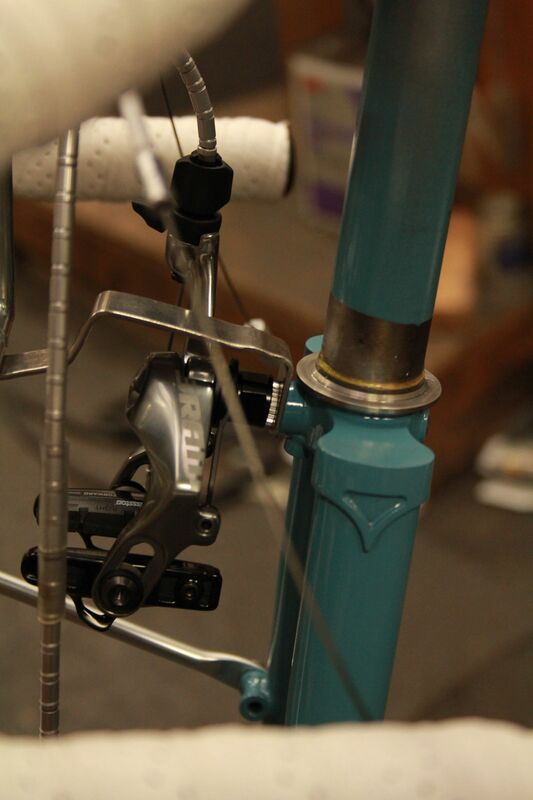 I chose the Nitto M1 rack for forks without cantilever bosses. I had to get a little creative with the brace meant to fit behind the front caliper. 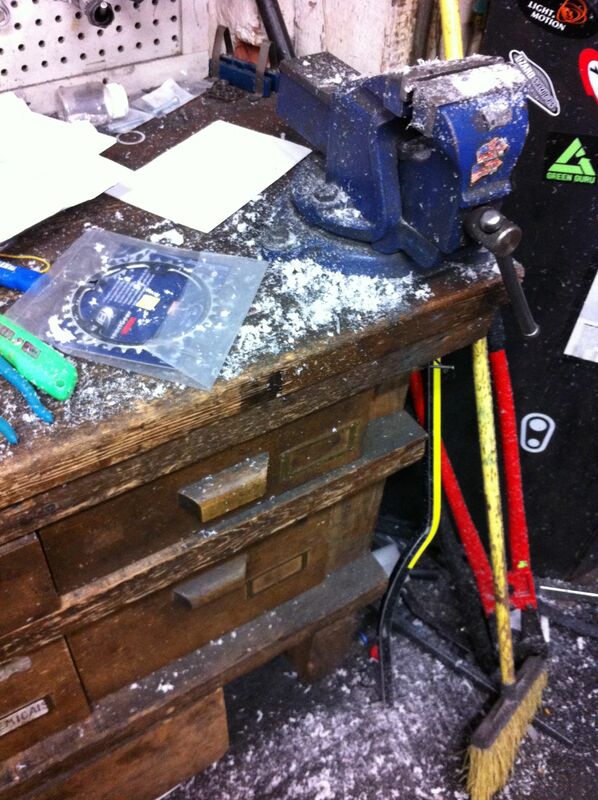 My design is little critical on clearance, so I chose to route the brace over the caliper. To better facilitate this, I switched the 1st-gen SRAM Red caliper (dual-pivot) to the newer, cam-actuated single pivot design because it had more clearance above the caliper, directly over the mounting bolt. As for the bag, I had already decided that I wanted the biggest bag that I could fit. The classic choice is the Gilles Berthoud series of bags. They are pricey, but they have a good reputation in the randonneur circles. Howver, they nearly all have the same footprint, so the larger capacity bags are proportionally taller. Since my bike is so small and handlebar distinctly low, a Berthoud bag would be almost half above the level of the bar. A co-worker mentioned that Seattle had a local bag-maker in Swift Industries. The Swift Ozette bag is much longer front-to-back than the Berthoud bags. What is more, Swift Industries’ Martina told me that I could have the dimensions altered for a slight upcharge. I chose the the large size Ozette but slightly shorter in height. Of course, Swift Industries offers the bags in a wide range of custom colours. I went with a discreet grey, waxed canvas but with one pocket of red with bright blue trim. Martina had the bag ready for me in almost exactly 30days, right on schedule. The Ozette has water proof liner and uses removable, corrugated plastic panels to stiffen the sides and bottom of the bag. The bag has one large front pocket and two small rear pockets, all with flaps held closed with elastic loops. There are two slip pockets on the sides, but because my handlebar straddles the bag closely, I cannot use them in practice. 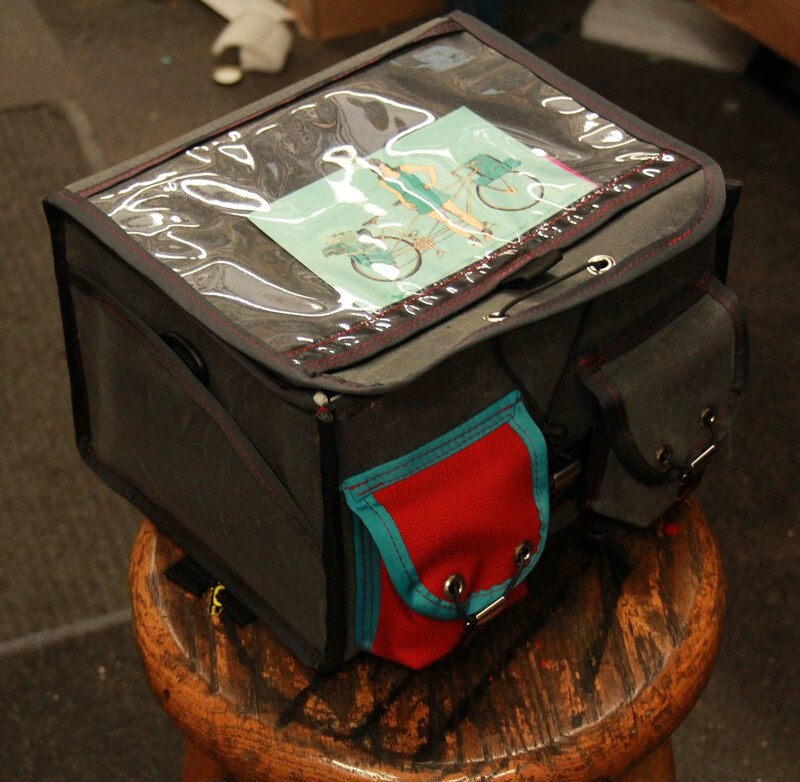 As befits any randonneur, there is a clear mapcase on the large flap covering the main compartment. Securing the bag to the rack provided a significant challenge. I wanted to be able to easily remove the bag after locking the bike to a rack, but I was adamant that the bag not sway at all while riding. 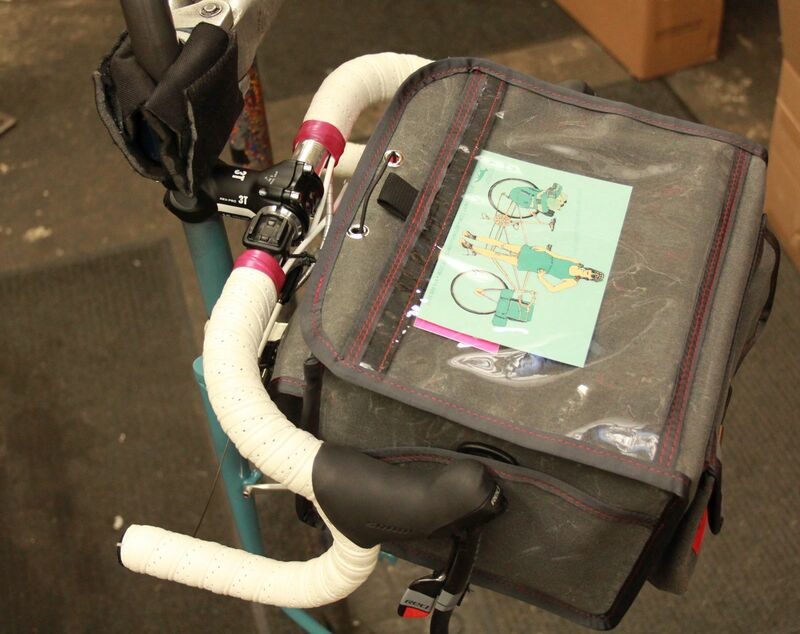 On an average size bike, the bag would sit below the handlebar and use a support called a decaleur to hold the top of the bag to the stem or headset. 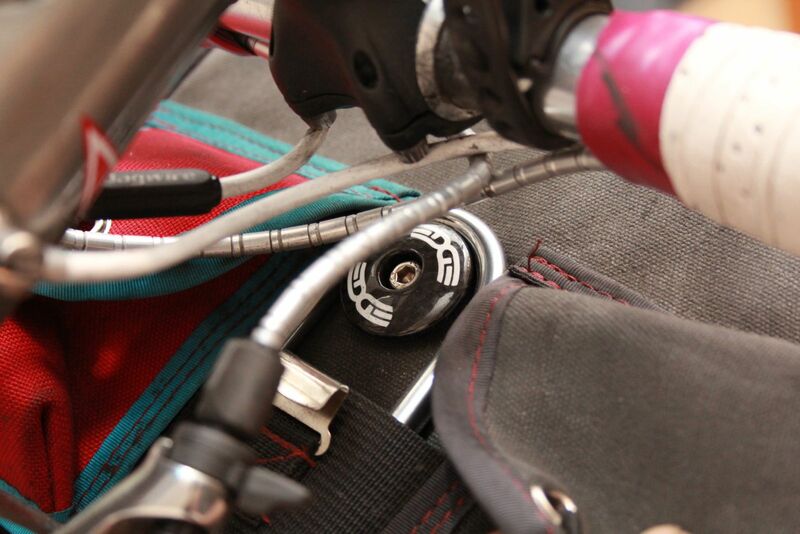 In many cases, rando riders choose to use nothing to secure the base of the bag, making it all the easier to lift the bag off after riding. But again, on my bike this is not possible. Instead of securing the top of the bag, I chose to fix the bottom and the back of the bag. I took a piece of plastic kitchen cutting board, and carefully carved with an air-driven router bit into a shape that would match the front of the Nitto rack. OK, so it actually took me three attempts to get it right (look at the pix after the jump to see how much semi-molten plastic chaff was generated). I then screwed it through the bottom of the bag, through a lateral plastic stringer I had slipped under the bag’s bottom stiffener. 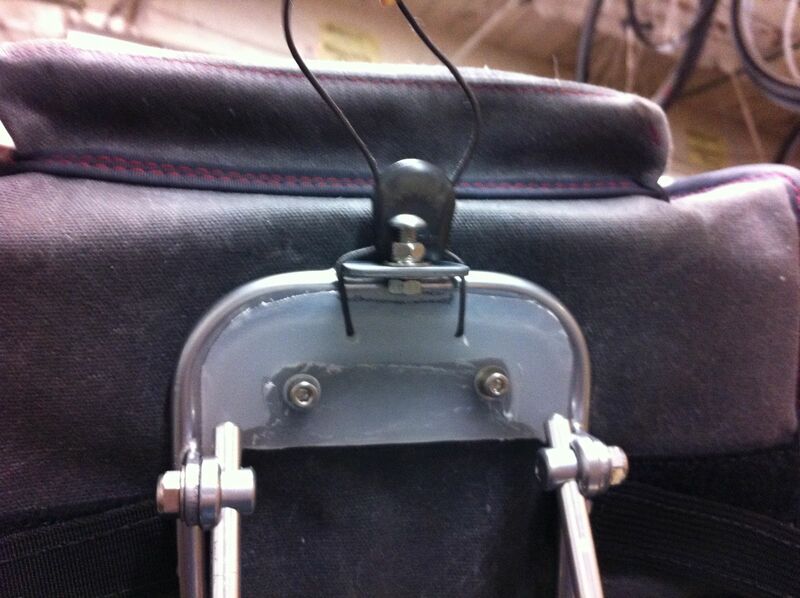 Then I added a catch made from a headset top cap to the back of the bag; it engages on the rack’s rear rest and keeps the top of the bag from swaying. With those two points secure, the bag stays put. Next time, maybe I’ll talk about how much use I’ve gotten out of the bag in the last 5-6 months and how I added attachments for lighting to the rack.